Two years ago, I went to Cambodia. It was an amazing place for many reasons, but the capital city of Phnom Penh, in particular, was like something out of the old west. As friendly as the people were, there was an overwhelming feeling that something, read: anything, could go down at any time. Had I known then what I know now, I wouldn’t have hesitated to say that there is a palpable feeling of magic in Cambodia. Exactly what sort, it’s hard to say. The truth is however, that Cambodia is a place where the notion of magic is no laughing matter. Though not as regularly practiced today, in earlier years and particularly during the Pol Pot regime and the subsequent Cambodian civil war, resistance fighters received highly detailed tattoos which were believed to bless the soldiers with special, magic abilities. As a soldier, it’s probably the best thing you can ask for. Anti-landmine protection for one, has got to come in serious handy. The tattoos are of course, done by magic men, or magic tattoo artists, and they are done by hand. A handle about 30-centimeters long is supplied with two syringes at the end. The tattoos are written in two different languages: Sanskrit or Pali. The magic itself, is based in Buddhist belief and in order for the spells to properly work, a strict manner of behaviour must be adhered to. Amongst the rules: no murder, no stealing, no committing adultery, be sure to pray and burn incense and recite magical mantras. These days the magic spells don’t seem to stick as well, as the old magic tattoo artists claim the new generations smoke and drink and chase women too much. 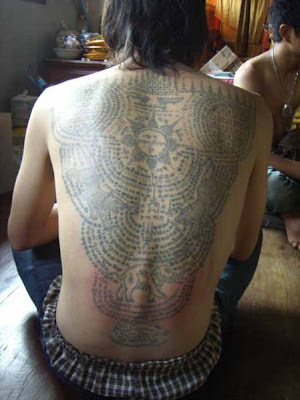 It is a dying tradition now in Cambodia, with very few of the original magic tattoo artists performing their craft. Still, it can be found amongst the new school of tattoo artists, but somehow, it just doesn’t seem the same. At any rate, this sort of tattoo work is without a doubt, amongst some of the most interesting tattoo forms to be found.